For my daughter's tenth birthday, she wanted to do something a little more grown-up than we had in the past. She loves planning parties, and so I put her in charge and gave her a budget. She liked having control over everything we did for the party, and it was actually a nice way to incorporate some learning into our summer birthday party. Mallory called and booked an appointment for four friends at one of my favorite nail salons. She found out each girl could get their toes painted for $10! Since it wasn't a "little girls' spa," her friends felt a little more grown-up. Especially sitting in the pedicure massage chairs! Mallory's grandmother told her about a recipe she had seen on Food Network by Giada De Laurentiis for Spa Water. 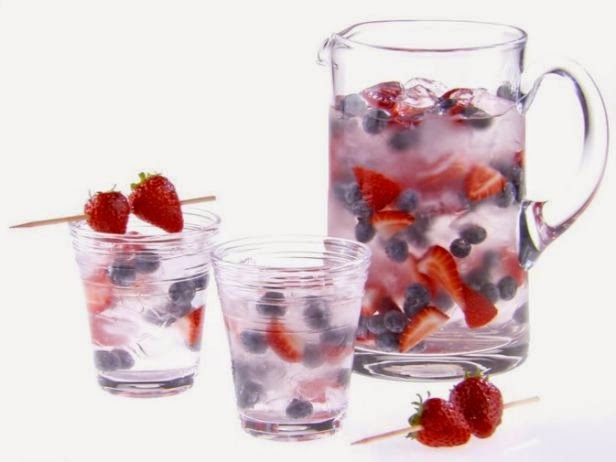 We infused cold water with strawberries and blueberries and brought it along to the party. It looked and tasted delicious. After dinner, we were off to the Loop for dinner (helped by a Groupon that Mallory found online) and then back home for banana splits and the new American Girl movie, Isabelle. Mallory and I had a lot of fun planning and making the party favors. I had some white paper boxes that I found at Target a while back, and we cut pink vinyl monograms for the girls using my Silhouette Cameo to go on the boxes. (Similar boxes can be found here.) Adorable. 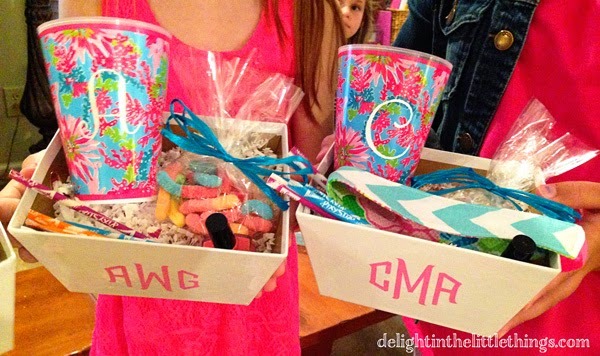 Next, we added a Lilly Pulitzer cup with a white vinyl letter monogram to each box (used my Cameo again for this project). The cups are from the Trippin' and Sippin' Tumbler Set, which can be bought here for $16. Mallory loved the bright blues and pinks. The white vinyl monogram really popped against those colors. We found some pretty nail polish by Jenna Hipp. We love that it has a 5 Free Formula that cuts out five of the worst kind of chemicals usually found in nail polish. 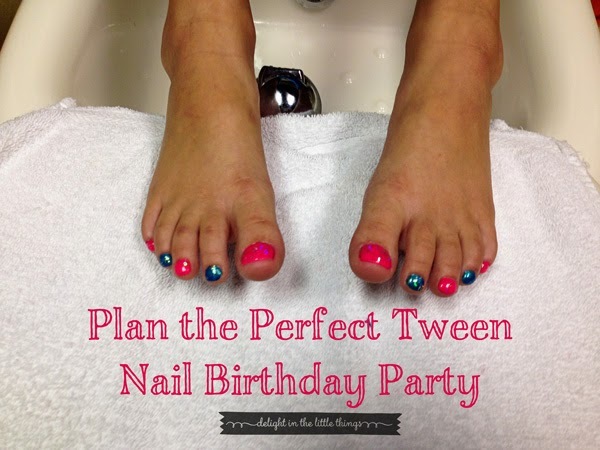 The colors are bright and fun, perfect for this set of tweens! Lastly, we added reversible fabric headbands that I made using fabric scraps and foldover elastic. Mallory made sure each one included a chevron, because that's her favorite pattern. Like mother, like daughter :) The headbands were super easy to make and made a really cute addition to the favor box. Here's a link to a great tutorial by Alice and Lois if you are interested in making your own. I can't believe my baby is ten, but just as I loved her baby and toddler years, it's so much fun enjoying some common interests now that she's getting bigger. What kinds of things do you like to do with your tween? Disclosure: We use Amazon affiliate links. Any and all posts on this site may contain affiliate links.